If you are getting ready to build a barn, we hope that our website will assist you in becoming more knowledgeable of different barn types & styles, building techniques, construction terms and much more! If you are planning to build a barn yourself, on this site you will find good information, tips & advice on proper barn construction. 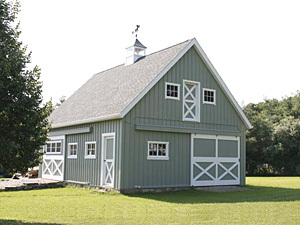 It is also a good information source for purchasing barn materials and hardware. If building a barn yourself is simply not an option and you are planning to hire a contractor, we still recommend familiarizing yourself with construction terms in order to better understand your quotes & contracts. It's also a good idea to arm yourself with a knowledge of must-have features in a properly constructed barn. Let's be honest, building a barn is not a simple task and requires some construction knowledge & experience. Our goal is to provide as much information about barns as possible, so you can at least have some idea of how barns are constructed. We would like to thank Keystone Barns for sharing images and other information for our website. If you would like to contribute your barn images, articles, etc. please let us know. This is just a small sample of what most of our visitors found useful on our site. We have much more information for you to see and to learn. Barn - is a structure, built with a main purpose of providing storage or to house a livestock. Some barns, especially Post & Beam and Timber Frame barns may also be converted into living quarters, or used for a business purpose. Business use for Timber Frame barns may include, but not limited to restaurants, retail shops, inns and others. In good old days, people used to build barns with materials they had at hand and whatever was readily available to them. Most of the old barns were built either out of wood or stone. These days however, we have a significantly higher number of construction materials available to build a barn. In addition to wood & stone, we now have steel, vinyl and different composite materials that can be used for either roofing or siding. Steel may also be used for framing as in a steel building. Who knows, perhaps in future, we'll have structural composite materials, or totally new material that we've never heard of. By now, you are probably wondering what's the best material to use for a barn construction. The only thing we can say, is the use of materials should be decided on an individual basis. Believe it or not, there are some communities that may not even allow you to build a simple barn with steel siding and might require to have something fancier such as wood, stucco, vinyl, etc. When choosing the type of materials to use, consider all the factors, such as your neighbors, local ordinances, cost (especially now), wind loads, snow loads, average annual temperature, probability of insect infestation and the intended use of the structure. For example, in Florida state, a barn built of stone (or concrete with stone finish) will keep the inside of your building cooler and will withstand significantly higher winds. In northern states, wooden barns might be a better choice, since wooden siding will keep your barn a little warmer in the winter.